NASA has taken "one small step" towards celebrating its history, while also promoting its next "giant leap." NASA is getting ready to mark the 50th Anniversary of the Apollo Program that landed a dozen Americans on the moon! Tonight [June 1] we revealed the official anniversary logo. Check it out! And that's all that the current 2018 NASA is capable of doing? What a pity! The reaction to the logo on social media has ranged from it being horrendous to outstanding, and every step in between. Personally, I like it! Time to take the next step — onto Mars! A terrible design in my opinion. It does nothing to capture the historic significance of Apollo rather than attempting to think about Mars. We've been talking about Mars for the past 50 years... talking. We should be highlighting Apollo and our remaining heroes, both the astronauts who made the journey and those who made it all happen. As much as I would personally prefer a purely history-focused logo, I can understand NASA's reasoning here. The agency sometimes gets criticized for looking back instead of forward, and so releasing a logo that solely highlights its history could invite further scrutiny in that regard. With this approach, NASA nods to both its past and future. We've already seen commemoratives created for the 50th anniversary and I am sure we will see more. 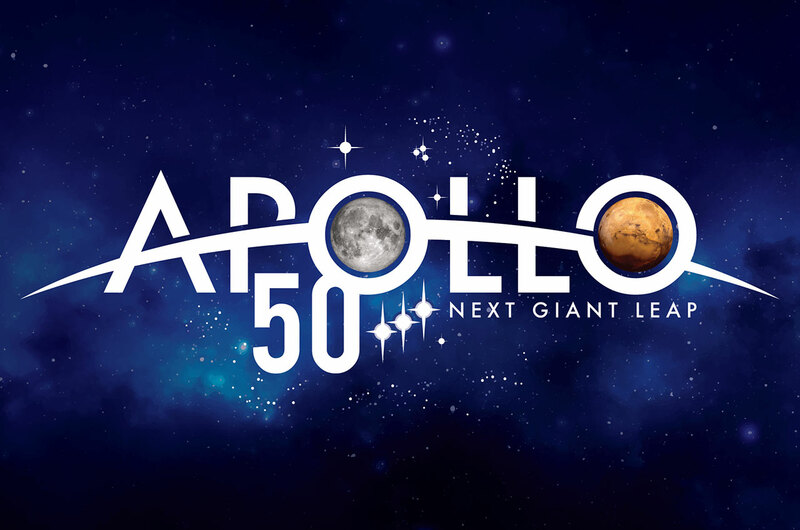 This logo is not going to be the only design to represent Apollo at 50. I get the use of the stars from the original Apollo Program logo, I also get the image of the moon. What I don't get is the use of the curved graphic that resemble the view from LEO as drawn on the NASA 60th logo or the inclusion of Mars in the Apollo 50th anniversary. While a mission to Mars was one of the reasons put up to support the cancelation of Apollo, today's plans for Mars are not the continuation of the original plan because that plan has been shelved many times. I think it is a long bow to draw to connect today's Mars mission plans with anything to do with Apollo, The people and tech have moved on and today's equipment is designed by a new generation. 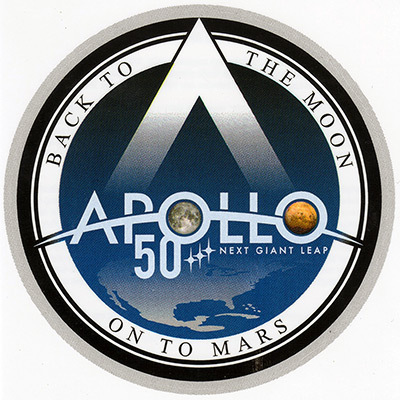 I would much rather that the 50th anniversary logo reflected Apollo and see a revamped original logo. Mars is more suitable for a NASA 60th logo and looking forward. To me it looks like this logo has just thrown some graphics from the original, with some from the 60th, to come up with something that looks like an afterthought. I may be wrong but didn't today's engineers go back to the Apollo capsule for clues on how to connect the command and service modules? Looking at the umbilical connection was one I think. 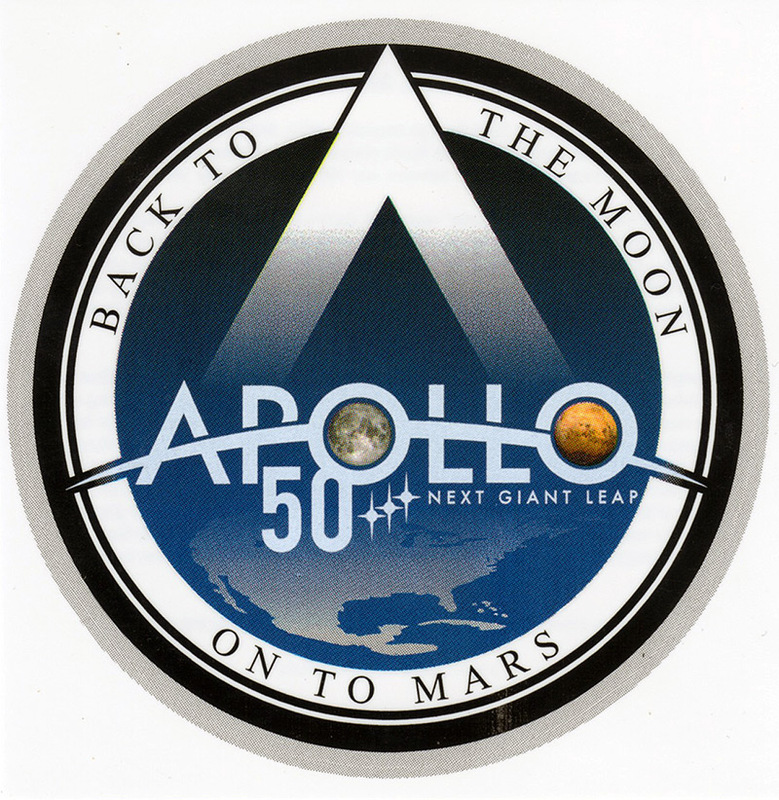 AB Emblem has manufactured a patch of this "Apollo 50 Next Giant Leap" design. It is 5" long by 1.5" high. It is another of the print/embroidery hybrid patches. The patch design number is: 401353. I have to ask, what value does anything like this have for collectors? Sure its cool for the short duration of the immediate anniversary, then afterward it doesn't seem like you can give stuff like this away once the anniversary has passed. NASA will be using this logo for the next four years (through December 2022, the 50th anniversary of Apollo 17). Skyforce Space Patches and The Space Store are now listing the patch available. The new original AB Emblem NASA Apollo 50 "First Giant Leap" patch is also available from us on eBay. Here's hoping someone produces a fully embroidered version instead of the hybrid print version currently available.